Really? 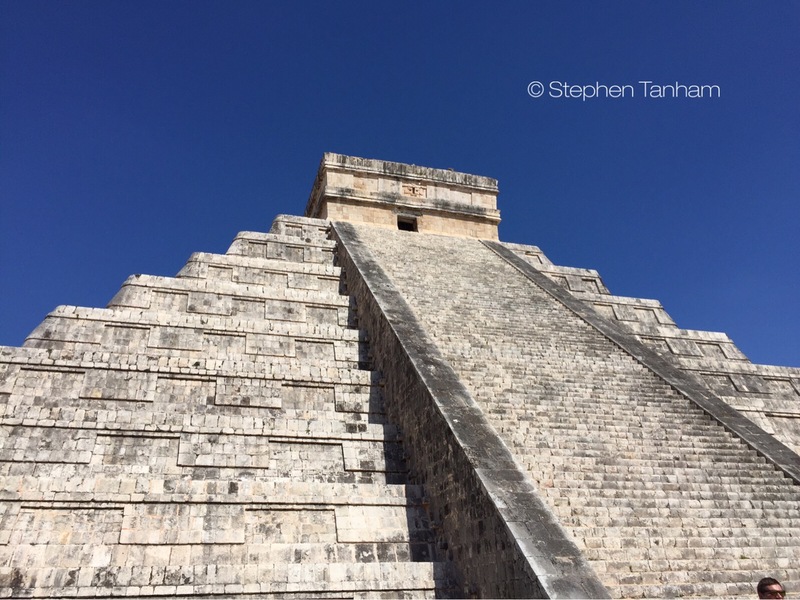 A giant, black, Jaguar materialised from the south face of the Chichen Itza pyramid and thundered across the ground to devour you? On one level, it’s a preposterous thing to write; on another, it’s the heart of the matter. Manuel had moved his guided group on, away from the the place of the first sighting of the temple complex, and to the fabled ‘ball court’, leaving a solitary figure staring at the pyramid, from which the jaguar that was filling his perception had emerged. They had split time, the Shaman and Manuel, the gentle guide; had opened a door of perception known about but never personally experienced in this form. I had, as I wrote in the last part of this narrative, resisted many of the ideas of shamanism, not because they were suspect, but because they used a symbol system with which I was not comfortable. But that said more about me than the system. There is only one set of spiritual truths; only one inner architecture of the soul. But there are as many ways of describing ‘it’ as there are life-forms that perceive it. And that’s its glory – that each one of us comes to ‘seeing’ in a unique way, a potency of ‘knowing vision’ that is really not about us, but is a revealing of the truth that stands before us, altering what was ‘our’ world, but really only dissolving the power of the egoic self to stop us seeing it as it is. Once the world is seen as it is, the ego has lost all its power. It doesn’t want that… If we could see what was fighting this, in all its frailty, we would no longer have any fear, and the egoic self could go about its business in peace and correct alignment. It didn’t hurt, but it did separate – in a way that was quite familiar from my studies of alchemy. In simple terms, it dared me to not be a tourist, to drop everything that thought like a tourist, as though, in the very word, it had found the perfect metaphor with which to communicate with its meal. Seeing I had grasped this, it followed the lines in my brain and came up with another: newfound. Time – rather, experience – had split. One of me had followed Manuel and the rest of the party around the corner and into the ball-court. The other had it’s attention fixed on the pyramid, under the inner, but silent tutelage of the consuming Jaguar. The newfound gazed up at the pyramid and Jerome’s voice came again, along with a mental picture of his hand-written notes. Manuel’s voice added itself, speaking to the tourists and the newfound in parallel time, using the same words. “The pyramid was both the theatre of daily ritual and – itself – the priest-maker. The newfound would be immersed in its outer and inner presence until they could hear its voice. The rituals were there to ensure that connection – the power was already present; a product of the pyramid’s perfect construction. The pyramid was made in an age before metal tools, and made with such exactness that no mortar was needed for its construction – we could not do that today. This perfection connected the worlds, in a way that objective truth always does. The newfound blinked his eyes. The descending presence of the Jaguar had pounced in an arena naked with the Sun’s power, and this now poured into his accepting psyche. Manuel’s eyes glistened as he turned, holding out his arms as though to touch the boundaries of the vast complex that is Chichen Itza. To the newfound, that made perfect sense. But far more important was his previous statement: This perfection connected the worlds. We think of ‘other worlds’ as though they are other planets – distant in time and space. But the ancient meaning of ‘other worlds’, protected in the lore of the western mystery tradition in all its forms, is that the separation is neither one of space or time, but is only one of experience. To experience one of the other forms of consciousness available and present, albeit latent, in our souls, is to be in that other world. But, unlike a study of alchemy, the Chichen Itza pyramid was also the map of the movement of cosmic life – the living cosmos in perfect miniature. The Jaguar, recognising that the newfound had reached the decisive moment, picked him, weightless, off the ground and began a loping prowl towards the steps of the south face of the pyramid. Chuckles… I’m just pointing out my flaws humanity, Jaye! x thank you for the reblog. You must, Alethea! But try to spend a full day there – the tours only give you a few hours and it’s not enough; not when the place starts to speak to you!